OVOO is a powerful, flexible and User friendly movie & Video Steaming CMS Pro with advance video contents management system. 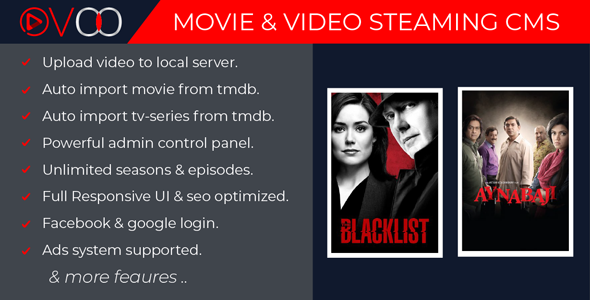 Itâ€™s easy to use & install.It has been created to provide unique experience to movie lover & movie site owner.To observe of ISP needed we have made ovoo to use as multipurpose video cms. This application was build with advanced modules and many more powerful features for a complete video website management. Furthermore, it also supports CSS3, HTML5 and Bootstrap 3 Framework that help use refined any device with semantic accuracy and highly customizable PHP based (CodeIgniter) application.